Norman Wilson’s illness shortly before the decimation of the 15th Battalion on the 1st July 1916 almost certainly save him from serious injury or death. While his unit was preparing for the attack at Serre he was being transported back to England for treatment for a medical condition. Norman was born on 22nd August 1897 and lived with his family at 43 Banstead Terrace, Rounday Road, Leeds. He was educated at Harehills School and North Leeds Commercial College. His father Joseph William Wilson (1868-), a Warehouseman, and his mother Maud Wilson née Houghton (1870-1958) married on 2nd September 1895. Both the 1901 and 1911 Census’ record the family were living at 6 Harehills Terrace, Roundhay Road, Leeds. Norman had five siblings, Eric (1900-1982) and Gladys (1900-1962), who were twins, Stanley (1902-1962), Thomas Leslie (1907-1948) and Frank (1909-1911). He married Beatrice Hall (1892-1965) on 4th July 1921 at the Parish Church, Wrangthorn, Yorkshire and at the time he was living at 136 Masham Avenue, Harehills, Leeds. Shortly after enlisting in the 15th Battalion at Colsterdale on 5th July 1915, he was posted to the 19th Battalion, West Yorkshire Regiment and in April 1916 was promoted to Lance Corporal. Norman was a clerk by trade and was 5’ 7 ¾” tall and weighed 118lbs. He was posted back to the 15th Battalion on 4th June 1916 and embarked for France on 16th June, although it was barely a week before he suffered Empyema Sinuses and was moved to the base camp at Etaples and the then to the UK on HS Brighton on 18th June 1916. On returning home he was sent to the General Hospital Nottingham where he remained until August 1916. He was put on the posted strength of the 19th Battalion and in August 1916 the 88th Training Reserve Battalion, and was allocated a new number. In November 1916 he was promoted to Corporal and in January 1917 was posted to the 3rd Battalion. He returned to France on 21st March 1917 and the following day was posted to the 2nd Battalion, having reverted back to Private and his original number. A month later he was transferred to the 12th Battalion, joining on 17th April 1917 and regained the rank of Lance Corporal. In May 1917 he suffered tonsillitis which was followed in June by influenza. He was again moved back to the base hospital where he remained until re-joining his Battalion on 25th July 1917. He was wounded in action in September 1917, sustaining a gunshot wound to the knee and left hand, and returned to England where he remained in hospital until mid-November. On 10th May 1918 he was sent to No 7 Officer Cadet Battalion and, on successfully completing the course, he was discharged to a commission in the 3rd Battalion, Special Reserve, West Yorkshire Regiment at Whitley Bay on 29th October 1918. Although his report said he ‘should make a good officer’ it also recorded that he ‘lacked confidence’ and was ‘backward in tactics’. Norman was demobilised on 13th January 1919 and relinquished his commission on 1st April 1920. For his service was awarded the British War Medal and Victory Medal. In 1939 he was living with his wife Beatrice at 28 Easterly Crescent, Leeds, and was employed as a Wholesale Food Distributer. He died at Leeds on 31st May 1956 at the age of 60. Albert’s service record has not survived, but his army number suggests that he enlisted some time in May or June of 1915. He probably did not go with the battalion to Egypt, as it is not mentioned on his Medal Card, nor was he awarded the 1915 Star, but he would have gone to France, as it was there that he was badly wounded, at some point in the early stages of the Battle of the Somme. He was treated in No.33 Casualty Clearing Station, France, but on 22nd August 1916 he died of his wounds, age 30. He is buried in Bethune Town Cemetery, Pas de Calais, and he was subsequently awarded the British War Medal and the Victory Medal. In 1939, when the Register was compiled for the next war, Ruthetta was listed as Ruth Frobisher, a widow, at 42 Pinfold Lane, Hemsworth, living with Edna Frobisher, a tailoress, born 17th June 1914, presumably her daughter, and Albert Frobisher, a bookstall manager, born 6th March 1911, along with his wife Lily, née Milner, who he had married in Pontefract in December 1936. John William Taylor, known as Jack, was probably born in December 1890, in Bridlington, the son of William and Ada, or Adela, Taylor, who had married in Leeds ten years before. He had four older siblings, Kate, Albert, Amy and Lily, and the family lived in Bridlington certainly into the war years, though for whatever reason John was not at home for the 1911 Census, and I’ve not so far located him anywhere else. The family address in 1891 was Dykes House, by 1901 they had moved to 17 Quay Road, and by 1911 to 21 Havelock Crescent, not far from 42 Havelock Crescent, the address given for his father as next of kin on John’s enlistment. When John left school he became a grocer’s assistant, and possibly worked in Bradford, as that is where, according to one source, he enlisted. He also had a diary (see later) supplied by George Jessop and Son Ltd, clothing manufacturers of Batley, but as this was complimentary it may not mean that he worked for them. His attestation papers were completed at Colsterdale, on 27th January 1915, and beside the occupation and next of kin details, also included his height at 5’ 6” and the fact that he was single. Six months later, however, on 6th July, he married Lily Cooper at Drypool Parish Church in Hull, and their son Frank was born on 2nd September. According to the family story John was given leave for the birth, but it proved not long enough. Once John had joined up Lily and Frank went to live with the family in Bridlington. John joined the Leeds Pals at Colsterdale, where he did his basic training, and sailed with the battalion for Egypt, where they landed on 22nd December 1915. After duty there they were posted to France, arriving in March 1916, to prepare for the Big Push. The Battle of the Somme commenced on 1st July 1916, and John was one of the lucky ones in that he was wounded on the first day, at Colincamps. He was hit by a bullet in his right arm, badly damaging his elbow. 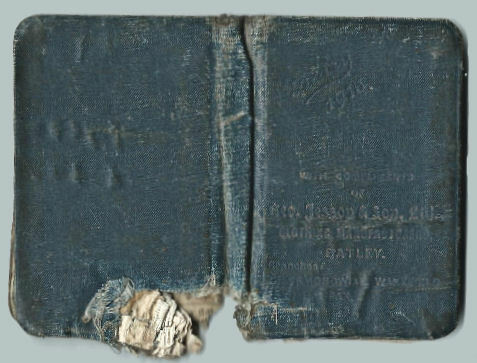 His medical records suggest that he was also hit in the back by shrapnel, and another family story recounts him describing how his diary, and/or a metal case, stopped a piece which would otherwise have done some serious injury. His gunshot wound was serious enough to put him in hospital for 2 months, spend a further 3 months convalescing, and ultimately to return him to England. He was finally discharged on 24th November and given 10 days’ leave, after which he reported to 89th Training Reserve Battalion at Cambois. A medical board examined him and concluded that he was no longer fit for active service, and that his capacity for earning a full livelihood had been reduced by a quarter. They recommended that he be transferred to Class P, which was effectively a discharge. This happened on 8th August 1917, and he was awarded a pension of 8/3 a week, to be re-assessed after a year. At this point his address was given as 4 Wansford Drive, Driffield. John was subsequently awarded the King’s Discharge certificate, the 1915 Star, the British War Medal and the Victory Medal. Clifford Twiss was born at Beverley, East Yorkshire on 22nd January 1879 (the day of the gallant defence of Rorke’s Drift in South Africa by the 24th Foot), and was the son of Edward E Twiss and Fanny M Twiss*. In 1891 the family, which also included siblings Edward F, Arthur M and Bertha M, was living at N. Bar Street, Beverley. Clifford married first in 1904 at Scarborough but was a widower by 1914; he had one child, Cynthia Eve, who was born in 1907 and died in 1968. Clifford was head boy at Shrewsbury school before moving on to study classics at Christ Church College, Oxford. He served for two years in the Oxford University Volunteers and, on leaving university, went to India to work in the Indian education services where he remained for twelve years. He also served for some time in the United Provinces Light Horse. In 1900, at the age of 21, he applied for a commission in the Infantry. *(The Peerage website states he was the son of Godfrey Twiss). When he joined the Army in 1914 he was listed as a widower and resident at Beverley, East Yorkshire. On 16th November 1914, he was appointed Captain in the 12th Battalion, East Yorkshire Regiment, becoming its adjutant on 16th August 1915. He was promoted to Major on 25th June 1917 and transferred to the 13th Battalion. On 17th September 1917 he was promoted Temporary Lieutenant Colonel of the same battalion. Awarded the DSO on 18th December 1917, which was gazetted on the 1st January 1918, he eventually took command of the Battalion on the 21st January 1918. On 15th March 1918, when the Pals were stationed near to the town of Arras, their Commanding Officer, Lieutenant Colonel Stuart Campbell Taylor, took command of the 93rd Brigade and Lieutenant Colonel Twiss was given Temporary command of the 15/17th Battalion. However, when the Battalion was attacking the German front line, near to the town of Moyenneville (the same action in which Sergeant Albert Mountain won the Victoria Cross) on 27th March 1918 Lieutenant Colonel Twiss was knocked over by a bullet, which had penetrated his helmet, and on his recovery he moved forward to find his men surrendering as they were being fired on from several directions. Hoping to avoid detection, he hid in a shell hole although a section of German troops passing by spotted him and threw a grenade at him. Upon being attacked by two more soldiers wielding rifles and bayonets he finally surrendered. He spent the remainder of 1918 as a prisoner of war. His German POW card shows he was held at Stralsund, Dänholm, an officers’ camp on the Baltic coast. His mother was recorded as Mrs Fanny M Twiss of Beverley, East Yorkshire. 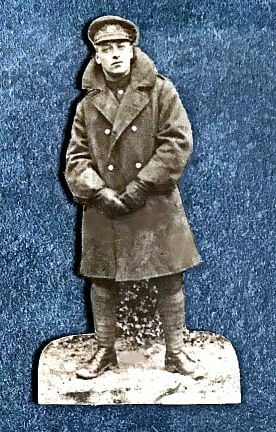 Clifford Twiss was repatriated on Christmas Day, 25th December 1918, nine months after being taken prisoner, and was given two months leave prior to taking up a new post with Eastern Command in England. He retired from the Army in 1920. After the war he was again in India State Service and in 1929 was recorded in the Passenger List on P&O ship Narkunda returning from Marseilles to London with his daughter Cynthia Eve, whose age is given as 21. Clifford Twiss married his second wife, Winifred Mary Wellesley (née Parker), born 10th November 1883, on 24th October 1933 at Erpingham and they lived at Barn Hill, Sheringham, Norfolk. He died on 13th February 1947 at Depwade. For his war service he was awarded the DSO, British War Medal and Victory Medal and was Mentioned in Despatches on 18th December 1917. Fred Rawling – came through the war unscathed! Fred Rawling was one of the few original Leeds Pals who appears to have come through the war without serious injury, which is extraordinary as he remained on active service with both the 15th Battalion and 15/17th Battalion for more than 3 years throughout hostilities. Enlisting at Colsterdale on 7th June 1915 he was described as being 24 years old, 5’ 6½” tall with fair physical development. His occupation at the time was Warehouseman. Following training there and at Ripon and Fovant he deployed with the Battalion to Egypt in December 1915 to defend the Suez Canal from the Turks. In March 1916 the unit moved to the Western Front in France to prepare for the Battle of the Somme. He was initially employed as Officers’ Mess waiter and was in 12 Section, 7 Platoon, B Company. If he remained in the role it may have been a contributing factor towards his survival. His records confirm he had home leave in July 1918 and leave in Paris in November that year. (Service Record & 1915 Leeds Pals Nominal Roll). In 1881 Fred’s father Metcalf, a Railway Engine Cleaner, was living at 2 Gladstone Street, Hunslet, Leeds with his father James Dobson Rawling, mother Selina and siblings Edith and Fred. (1881 Census). Metcalf married Hannah Mary Rawling nèe Blackburn at Holbeck in 1887 and their son Fred (named after his uncle) was born in Leeds on 5th January 1890. In 1891 Fred was living with his parents and sister Gladys at 69 Quadrant Street, Leeds. His father Metcalf, who was born on 15th November 1863, was a grocer / shopkeeper; his mother was born in 1859, both in Leeds. (1891 Census). The family were still living at 69 Quadrant Street in 1901, and Metcalf was still a grocer. (1901 Census). By 1911 the family had moved to 4 Barton Terrace, Malvern Road, Beeston Hill, Leeds and Fred, now 21, was employed as a Draper, while Metcalf was now working as a Registered Money-lender. (1911 Census). After surviving all the Pals major battles (the Somme 1916, Arras 1917, the German offensive in the Spring of 1918 and the final push in the Autumn later that year) Fred transferred to the Reserve on 9th April 1919 and was finally discharged on 31st March 1920. On the Absent Voters Register his address was given as 3 Barton View, Leeds, together with his parents, although by 1939 Fred was living with his father Metcalf at 4 Barton Terrace. He was a 49 year old Traveller and was single. Metcalf was living at 41 Harrowby Road, Far Headingly when he died on 10th March 1949, leaving Fred and others some £17,000, a considerable amount at the time. Fred died in 1974 and his funeral at Lawnswood was attended by several Pals, most in their 80s. They had travelled there by bus and the family were so grateful they gave them enough money to have a drink and get a taxi home. (Jonathan Chappell). 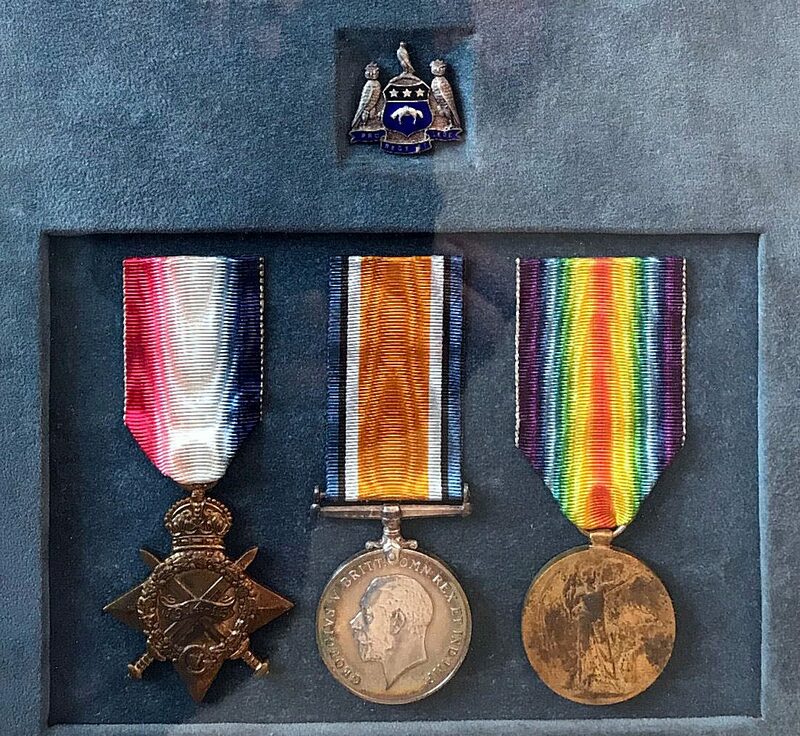 For his war service he received the 1914-15 Star, British War Medal and Victory Medal which remain with his family. William John Bass was a pre-war regular soldier who had served in India and Malta and therefore was more experienced as a soldier compared to those who joined from 1914. He was born at Matching Green, Harlow, Essex in 1888, employed as a Farm Labourer and enlisted in the King’s Royal Rifles Special Reserve, before joining the West Yorkshire Regiment at Woolwich on 11th June 1909. He joined the 2nd Battalion, as 9195 Private Bass, at Aldershot the following day as a Signaller and remained there before moving with the Battalion to Colchester in 1910 and to Rawal Pindi in the East Indies (India) in 1911. He returned to Litchfield later in 1911 then proceeded to Malta for a year in 1913-14 before the Battalion was recalled home in September 1914. While in Malta he passed his 3rd Class Certificate of Education. His address at the time was 57 Lawrence Road, Edmunton, Essex. William was 5’ 3” tall, weighed 115 lbs and had a 35” chest. His complexion was fresh and he had black hair and blue eyes. He had some scars on his forehead and leg, numerous tattoos (one expressing his love for his mother) and, although only 19 years of age, he had a bald patch on top of his head. His military character was described as ‘Indifferent’ which is evident from his lengthy conduct records, and although declared ‘fit’ seemed to suffer numerous medical and social ailments. His troubles began in early 1910 at Colchester when he ‘quit barracks as a defaulter’ and during 1910 he was absent, and drunk on several occasions. In 1912 and 1913 at Litchfield he was tried by District Court Martial for absence, for which he served 6 days detention, and he committed a number of other offences involving absence, drunkenness, abusive language and causing a disturbance. Then followed 14 days Field Punishment for drunkenness in December 1914; three days Field Punishment in January 1916 for absence, and later that month he forfeited one day’s pay, again for absence. Despite all this he was promoted Lance Corporal on 11th July 1916, Corporal on 25th October 1916 and on 20th July 1917 was elevated to Acting Sergeant. However on 11th October 1917 he was reduced to the ranks by the Corps Commander of 8th Corps under Section 183(2) of the Army Act (Inefficiency). After a short time with the 3rd Battalion, during which time he was tried by District Court Martial for desertion, which was later changed to absence, he served 84 days in detention. He committed a number of other offences before being posted to the 15/17th Battalion on 16th April 1918. However, he had to return to the UK in August 1918, due to illness, although he again went absent, for which he forfeited 18 days’ pay. Again promoted Lance Corporal in November 1918 he lost his stripes in January 1919 when he refused to obey an order and for resisting arrest. He finally transferred to the Army Reserve on 7th February 1919. In spite of all this he must, with his wide experience of soldiering, have been a very useful resource for newly enlisted men. Like most men William suffered badly on the frontline; in February 1915 he was admitted to 26th Field Ambulance and 6th General Hospital with a sprained ankle, which was to become a reoccurring injury throughout his war service; he remained at the Convalescent and Base Depots from March to May 1915. On 5th March 1917 he was wounded in action, on 20th March 1917 he received a gunshot wound in the buttock and on 16th August 1917 he received a shrapnel wound in the left arm which was treated at the 34th General Hospital. In addition, he suffered shell shock, when a shell landed next to the duckboard he was walking on in the trenches. He also suffered several illnesses, including carbolic acid infection in 1910, gonorrhoea (several times from 1910), hysteria in 1914 while in Malta, neurasthenia on 12th December 1917 and had appendicitis on 10th August 1918. He returned to England for this and spent some time in the 1st East General Hospital Cambridge. He also suffered liver trouble in November 1920, which was believed to be caused by drinking bad water while on active service. His father was William Bass, mother Elizabeth and his sisters were Alice and Emily. The family lived at Coopersale Street, Epping. William married Charlotte Clarke, a widow, at the Parish Church, Harlow on 18th December 1915. His address when he retired was 22 Market Street, Harlow, Essex. He is believed to have died in Brentwood, Essex in late 1964 age 76. For his 9½ years’ service in the Army he was awarded the 1914 Star and Clasp, British War Medal and Victory Medal. He applied to the Ministry of Pensions London for a disability pension in 1920, which was supported by the Military War Pensions Edmonton Committee, although it is not clear whether he received one.